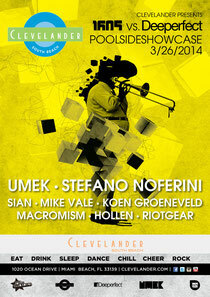 1605 and Deeperfect host The Clevelander in Miami on 26 March. As part of Miami Music Week, the two techno/tech house labels join together to shake Ocean Drive and bring some hot European sounds to Miami. The event will be headlined by both labels' chiefs, UMEK and Stefano Noferini, accompanied by tribe members Koen Groeneveld, Sian, Mike Vale, Macromism, Hollen and Riotgear. Check the flyer for full info.